Siemens Gamesa has launched the SG 10.0-193 DD, the company’s first 10+ MW offshore wind turbine. The 10 MW rating is made possible through a larger generator diameter, building on the Siemens Gamesa Direct Drive generator technology, the company said. By increasing the rotor diameter to 193 meters, this new wind turbine is said to offer up to 30% more AEP than its predecessor, the SG 8.0-167 DD. Its 94-meter-long-blades provide a swept area of 29,300m2. Each blade is almost the same length as one soccer field. “The new SG 10.0-193 DD combines experiences and knowledge from five generations of proven direct drive technology in one 10 MW turbine. 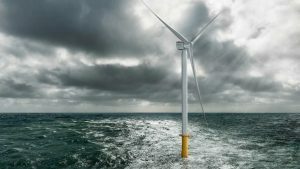 A showcase of strong performance, swift time-to-market, and low risk in the offshore wind energy market,” said Markus Tacke, CEO of Siemens Gamesa. The technology on the offshore direct drive platform allows for the re-use of most components from previous generations, providing a short time to market, the company said. The prototype is expected to be installed in 2019 with commercial market deployment expected in 2022. “Siemens Gamesa has been applying its knowledge and experience directly into offshore wind turbines for decades. Utilizing proven components and concepts provides us with a strong, established value chain, with clear processes and skilled employees ready to go, leveraging on a fully-developed and industrialized supply chain,” said Andreas Nauen, CEO of the Siemens Gamesa Offshore Business Unit. The nacelles of this new offshore wind turbine will be initially manufactured at the factory in Cuxhaven, Germany. The annual energy production of one SG 10.0-193 DD is sufficient to supply about 10,000 European households with electricity, according to the company. This means that an offshore wind farm composed of 20 of these turbines would cover the annual electricity consumption of a city the size of Liverpool. “The Levelized Cost of Energy from offshore wind continues to decrease as industry scale and performance grow. New markets are developing across the globe, all of which require cost-efficient, reliable, and clean power for generations. The SG 10.0-193 DD enables us as market leaders to meet these needs in close cooperation with our customers, stakeholders, and society-at-large,” Nauen said.